In the Eighth pAsuram – Looking at a pUvai (maina) bird, parAnkusa nAyaki tells about her great fatigue (exhasution) that was caused due to separation from emperumAn. Subsequently, parAnkusa nAyaki tells her young pet maina which was raised by her, “Go and tell the one who has endless vAthsalyam (motherly forbearance) about my disease (in separation)”. In the Eighth pAsuram, parAnkusa nAyaki tells about her disease to her pet maina which is exhausted seeing her state of fatigue. Eighth pAsuram – Previously when parAnkusa nAyaki was discussing and sharing her emotion, the pUvai (maina) also sustained itself – but when she was exhausted, it also became exhausted. Seeing that parAnkusa nAyaki tells “‘Previously I told you to inform my state to him’ – you ignored my requests out of pride, now I am going to die soon. So, you find some one who can take care of you”. pUvai – nAgaNavAippuL – a type of bird. siRu pUvAy – Oh bird that is small due to your tender age! nIyalaiyE – isn’t that you? Oh maina that is small due to your tender age! Having requested you to go as my messenger and tell emperumAn who is greatly mad (Out of unbounded vAthsalyam towards his devotees) about my disease in separation, you ignored my request out of pride inspite of you being raised by me. I have lost my radiant luster and color from my body. After this, you have search for some one who can comfortably feed you sweet food that fits your beak/mouth. From this, it can be understood that not performing small kainkaryams to gataka (AchArya) is a loss to oneself (sishya). Also, “siRu pUvAy” (small maina) – gatakas (AchAryas) even while young, are to be respected/cherished is understood. nIyalaiyE – Isn’t this you? I requested you to inform my state to him – but you have ignored my request. So, we have to this situation because of your inaction. If you informed him and he did not turn up, it his fault – but now we cannot say that its his fault since you have not gone and informed him. parAnkusa nAyaki establishes that bhagavallAbam (achieving emperumAn) is by the efforts of gataka (AchArya). Even though one has eternal relationship with bhagavAn, AchArya is cherished due to the favour (of reminding about that eternal relationship) done by him. As explained in “AdhadhItha yathO gyAnam tham pUrvam abivAdhayEth” – one shall first offer obeisances to AchArya from who he grasps different types of knowledge. sIRu pUvAy – youthful maina – your immaturity caused this difficulty for us. nedumAlArkku – you don’t need to create vyAmOha (bewilderment) in him (he is already greatly mad about his devotees). In thamizh, mAl means mad. en thUthAy – if both were equally longing for each other, no need for the messenger. chiravasanam – When dhasaratha sees beautiful clothes, he says “this is for our son” – such bharatha is wearing tree-bark-robes. 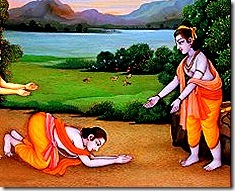 prAnjalim – one who always performs charity to those who join their palms towards him – he now has joined palms. pathitham bhuvi – the bharatha who is said as “ankE bharatham Aropya” (srI rAma placing bharatha on his lap), one who sleeps on lap since he is so tender that even sleeping on bed could be irritating – he is now lying on the ground. sAyalodu maNimAmai thaLarnthEn nAn – What is the result of you not informing my state to him? I lost both my luster and color. The maina said “I will inform him at once”; But what is the use of building a dam after floods drained? Similarly, what is the use of informing now after me losing everything? ini unathu vAyalagil innadisil vaippArai nAdAyE – Even if he comes now, the lost luster and color will not be back. You go and seek out your caretaker now. periya thirumalai nambi had a small archchA vigraham (deity) of krishNa named “veNNeykkAdum piLLai” (one who dances for butter) in his thiruvArAdhanam. In his last moments, he asked to remove the screen in front of the thiruvArAdhana perumAL and said to the emperumAn “sAyalodu maNimAmai thaLarnthEn nAn, ini unathu vAyalagil innadisil vaippArai nAdAyE” (My time is up here, you have to find some one to worship you in this world). This entry was posted in thiruvAimozhi, thiruvAimozhi 1st centum on July 25, 2015 by Sarathy Thothathri. Thank you for sending nalayara dhivya prabandham. Please send if you can. I will be very much thankful to you.